All transactions are safe and secure with a reliable history in online purchasing behind each of our associates. Buy the No Mercy Johnny Lawrence t-shirt to own Karate Kid clothing and merchandise. A newer favorite from our Karate Kid t-shirts selection, the Johnny No Mercy Cobra Kai tee lets everyone know that Mr. Miyagi's teaching was no match for your skills. It proves that instructing Daniel to "wax on, wax off" when polishing his classic car was pretty much a waste of time. Mr. Miyagi may seem like an innocent old man, but he has experienced many things worse than John Creese (Martin Kove). Utter your favorite Karate Kid movie quote in this shirt that shows that you can take a crane kick or two. 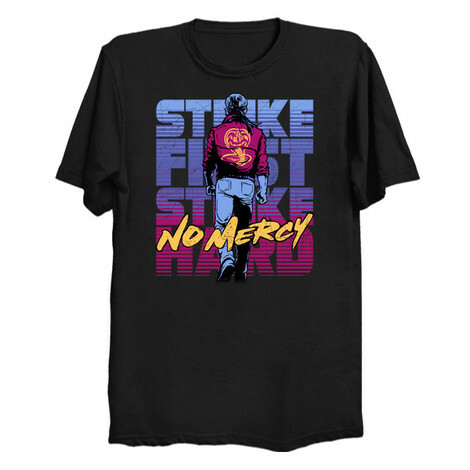 In addition to the No Mercy Johnny Lawrence tee above, browse the Karate Kid Clothing Gallery for more apparel like men's and women's clothes, kids shirts or hoodies.